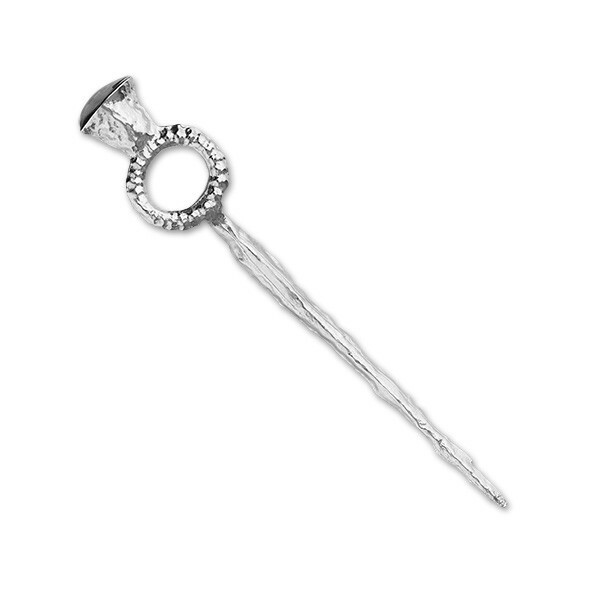 This section aims to answer the most commonly asked questions about the pin, its form and its creation. Is it supposed to represent a thistle? Oddly this question comes up a lot. The bulb at the top of the pin does indeed give it a thistle like appearance. The bulb is in fact the pour spout where the metal would have been poured into the mould. 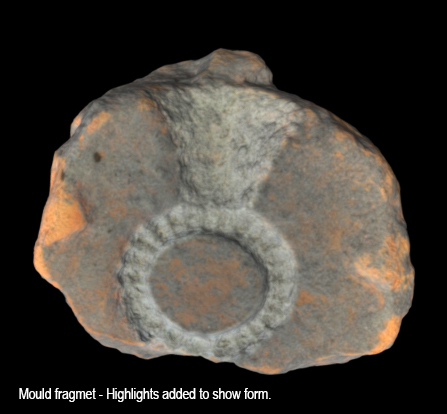 If you look at the mould itself (below) you can see the indentation of the spout. Interestingly Iron Age pins do develop into stylised thistle forms a few centuries later and it begs the question was this pour spout part of that transformation. Where / How was this pin found? Only the mould fragments that created the pin have been found so far. The Cairns site is still undergoing excavation and at the time of writing (May 2017) no pin resembling that shape has been recovered from the site. There have been similar pins recovered from other sites. This pin recovered from the broch excavation at Howe, Orkney shows a similar design to the head of the pin but is much shorter. You can see this artefact at the Orkney Museum in Kirkwall. What would the pin have been used for? While various theories have been put forward over the years there has been no conclusive proof as the to precise function of these pins. It is assumed that they would be for holding something closed such as a shawl or scarf but the method of doing so is often debated. 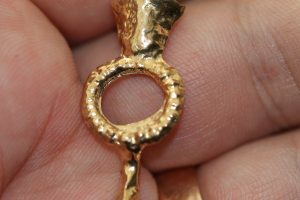 Some have suggested that a thread would have been tied to the ring part then tied to the bottom of the shaft end to form a fastener. While its an interesting idea I disagree with this partly due to the impracticality of it, but also the availability of the fibular brooch design during this period which is a far better method of securing clothing in that fashion. One thing that has been revealed from this project is the shiney nature of the pin. Archaeologically speaking we tend to see bronze objects after they have significantly tarnished. By 3D printing in bronze we were able to see the pin as it would have looked after creation which certainly has generated statements such as “its so shiney!”. Its possible to imagine these objects as being created for prestige purposes or perhaps as some kind of gift for service or fealty to the people in charge. We will likely never know for sure and I for one enjoy new ideas that people come up with as to their purpose and use. How can I find out more about this amazing archaeological artefact and site?